I think the dracos can pulse because their fuel is hypergolic. There's a big difference between opening and closing a valve and spinning up turbo pumps. Yes, that's exactly the point he was making. If you want a responsive thruster able to pulse rapidly, it has to be pressure fed. No matter if the propellant is hypergolic or cryogenic. I believe that's the case with closed cycle TP, but on an open cycle, like that Gas Generator, couldn't you just put a throttling valve between the TP pump and the injectors and simply restrict flow while reducing the gg gas flow? That's essentially what you do with face throttling. You have to avoid pump stall, but that just means throttling the GG, which is how the Merlin apparently does it. Why would you need to throttle the GG at all? Split the flow downstream of the main fuel valve (and/or the main oxidiser valve), prior to the injector, and add a second flow path back to the tank, controlled by a valve. Now, if this back-to-tank valve is fully closed, the engine operates as it did previously. If it's open, then the pressurised fuel/oxidiser that exits the turbo-pump simply makes its way back to the tank instead of the combustion chamber. You wouldn't get rid of the combustion stability, and transition forces issues that would be introduced by pulsing/rapid deep-throttling, but you would - in my head atleast - be able to throttle the engine, without needing to change the speed of the turbo-pumps, or throttling the gas generator. There would be new problems of course. One I can think of is with respect to maintaining the back-to-tank flow path at cryogenic temperatures - in case of the LOX, as well as avoiding getting filler gas bubbles flowing back into the pipe etc. 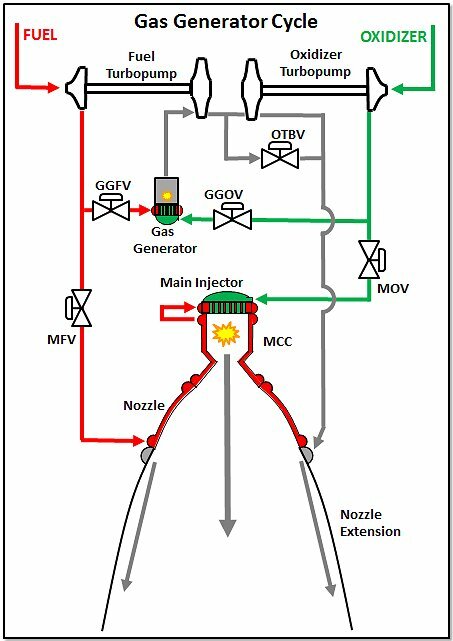 You could do it only on the fuel side, but that would mean that whenever you throttled down, you'd be burning oxidiser-rich, and probably a lot hotter than the design of the nozzle/combustion chamber was designed to cope with. Lots of reasons why you don't want to pump back into the tank, but mainly what you are suggesting is similar to something we work to avoid – geysering. At least in the Merlin 1D case, GG already throttles, so no harm in coupling to it. Furthermore, you'd be wasting the prop flow through the GG to uselessly pump prop back into the tank, which compounds the ISP loss inherent to using a GG cycle. Since it's pretty common to run engines throttled during launch to limit acceleration Gs it'd amount to a significant penalty. Question for the real rocket scientists around here: If this valve claims to tolerate LOX at 100 degrees Fahrenheit, then what is the state of the "liquid" oxygen then? Gaseous, or pressure-induced liquid? GG exhaust is low pressure, low velocity, so you aren't going to get useful thrust out of it. If you changed that, you'd just make it less efficient at powering the pumps. I have no idea why they wrote that into the spec. Perhaps someone else does? Depends on your definition of "useful." The 1.5E6-lbf F-1 generates 40K-lbf thrust with its GG exhaust after spinning the turbine and being used as a heat exchanger fluid. I think you'll find it's a typo, and they meant to write "-100"... but, either way, it's a pretty impressive piece of kit. Only when it's pumping fuel to the main engines. If you tried to do that without an equivalent load on the turbopump you'd just blow it up from overspeed. Thrust isn't linear with respect to throttle, most of it comes at the very end, when the flow is restricted enough by the throat of the nozzle that your chamber pressure and exhaust velocity climb. Think of the combustion chamber like a balloon. If you let the gasses through a narrow constriction, they go fast, and in one direction, so you get thrust. If you let the gasses go anywhere without restriction, you get very little thrust, like a campfire. Might that be useful to perform a quick test with water? Since the tubes are of comparable diameters, I'd say the densities are comparable, and so both fluids are the same and very likely liquid. Ok, so first of all I want to explain a few things. 1) This video was provided to us by a L2 member and it was placed in there as a pre-empt to what we assumed would be a speedy turnaround of the actual video you see on the screen, by SpaceX. 2) In what is a very rare incident, it was leaked out of L2 by a Reddit member. Note: 99 percent of Reddit SpaceX fans are absolutely fine, some are actually really great and a lot are crossover fans, but there's a tiny group - people who were banned from here for profanity and attacking SpaceX - and specifically Elon - with lies, who appear to have taken it upon themselves to attack NSF at every opportunity, and myself. We assume it was one of those who leaked this. We were going to turn it around, but we are a media site, not a social media gathering, and as such we seek actual permissions. 3) Thankfully, we now have permission to post this openly, without having to use the links of those who clearly have absolutely no regard for sourcing or accreditation. I appreciate NSF members' patience in waiting for a sanctioned upload, which has been uploaded to one of the CRS-3 Propulsive Landing Video youtube accounts.